On my blog, at least. I find I keep taking pictures of this hat and there are at least two reasons. One is that the colors and texture are so interesting to me but very hard to capture. I love how the ribbing looks corrugated and three dimensional. I love how the two different sides each have such distinct character. The other reason I keep taking pictures is because I keep making mistakes and reworking it, so it’s taking forever! Aaaack!! And that’s just one side. There were also four stitch holders on the other side. Nine columns plus countless hours of work already equal one big sea of yarn barf. I started trying to work it back up but, shocking to no one but me, it was just too loose and I couldn’t tell where everything was supposed to go. I gave up temporarily, set it aside and worked on something else. Yesterday I had some time to hang out at my LYS. I showed a couple of people the state of things and slowly concocted a plan. I would insert a lifeline below the damaged area and pull it back. Well, that was also tricky. Because of the nature of the pattern (every row you knit/purl into the stitch below the one on the needle for half the stitches) there’s not a lot of distinction between where one row ends and the next one starts, vertically speaking. Each row sort of nestles on top of the one before like crenelated yarn Legos. Weird image, I know, but that’s the best way I can describe it. So my initial attempts at putting in a lifeline looked like a road painter had gone to work drunk. Eventually I stumbled on the idea of putting in two lifelines. Each went through all the knit stitches on one side. It took a long time, but I did it and then ripped back. 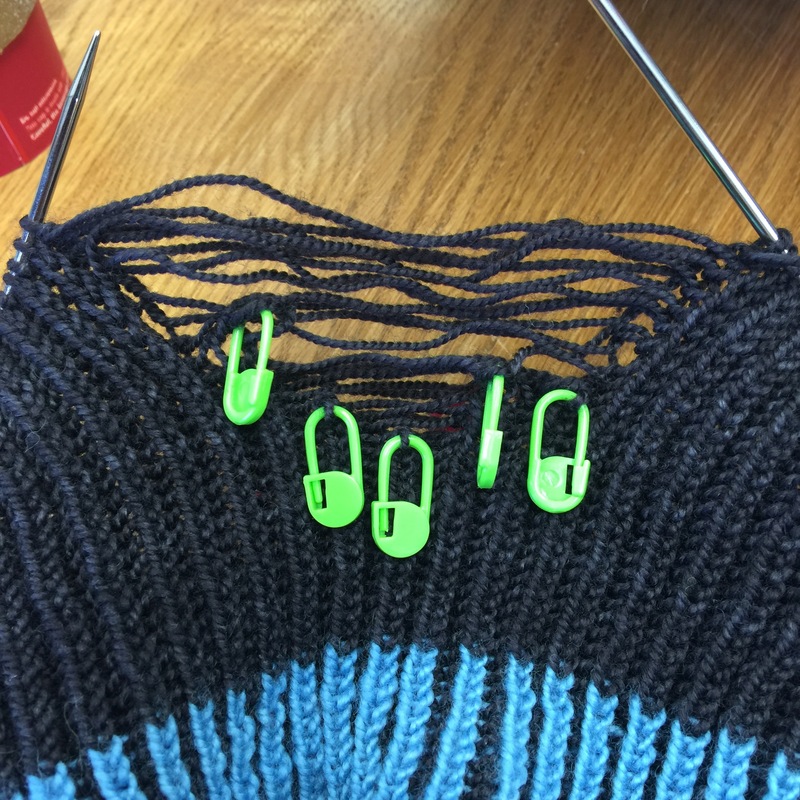 I then had to get all the stitches back on the needles and get them oriented right, etc. I probably tinked back about another row on top of that to get it all right. But, get it all right I did! It set me back some in terms of length, but it will be done right. I might put in a lifeline as I go this time, but we’ll see! Despite the three FOs I posted about yesterday it doesn’t seem like much is coming off the needles. Maybe it’s because I can’t really get into a groove with anything. I’ve cast on three times for my commission stocking but it hasn’t quite worked out yet. I’ve made some decent progress on the car blanket (30%!) but I’ve misplaced one of the skeins of yarn so need to find that. I have a test knit to do that uses the same needles so I keep putting off starting that as I don’t want to delay work on the car blanket. I have another test knit to do but can’t remember where I put the yarn for it, etc. etc. I think I just need to buckle down and get going on something and it will all work out. 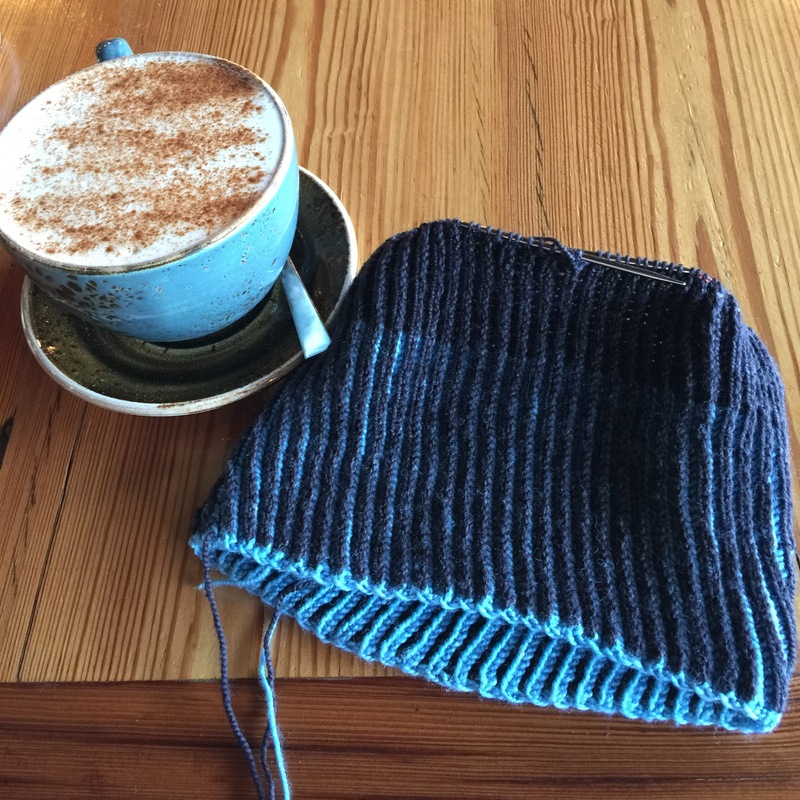 I’ve got about an hour and a latte so I’ll try to crank some decent knitting out! In other, very exciting news, I won a prize from the Passport Mitts KAL! I found out last night that I’ve won a lovely skein of handspun yarn. I can’t wait to find out what it wants to be! Oh wow! 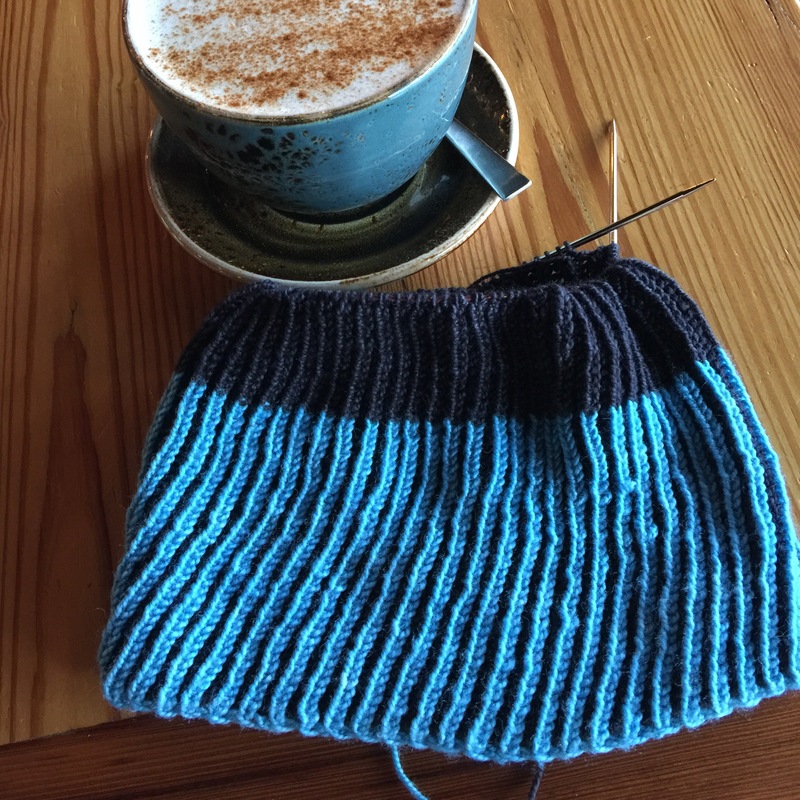 Brioche is very tricky to fix dropped stitches in for one column, but a whole chunk like that? Very impressed by how you handled and fixed that! I feel ya, girl. Good job on fixing your mistake. Phew. You are patient. That would have given me a heart attack. It pretty much did. There was lots of putting it aside until I could handle it. It almost got scrapped more than a couple times. I was sort of internally screaming at the picture of the dissected hat. Glad it worked out. Brioche is so pretty, but so fiddly too. I just live in a state of denial if I make any sort of minor mistakes and pretend that the project no longer exists if I make any big ones. You saved the day!!! This sounds like a beast of a project but if I didn’t before, I can more than confidently say you totally got this!